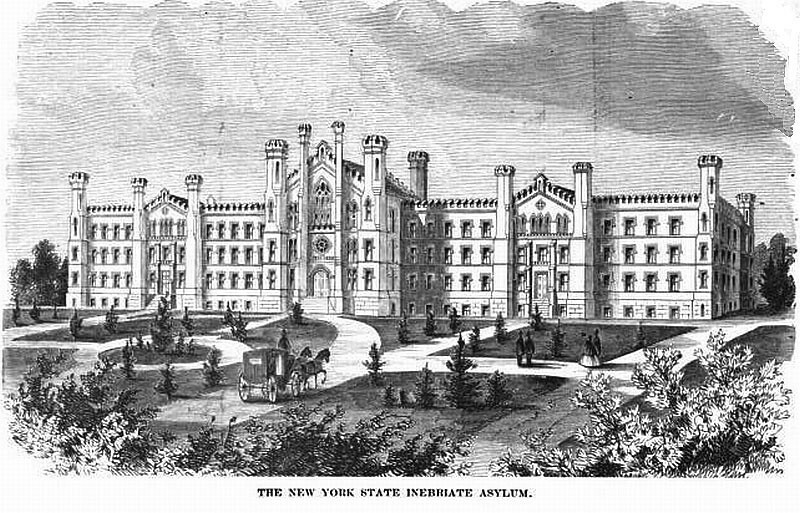 The New York State Inebriate Asylum, which later became the Binghamton State Hospital, was the first institution designed and constructed to treat alcoholism as a mental disorder. 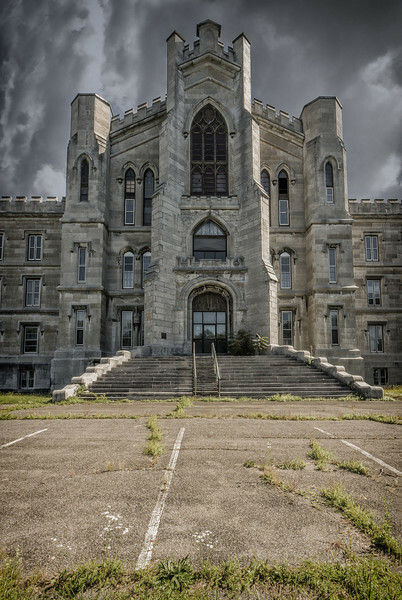 Located in Binghamton, NY, its imposing Gothic Revival exterior was designed by New York architect Isaac G. Perry and construction was completed in 1864. In 1993, the main building was closed due to safety concerns. 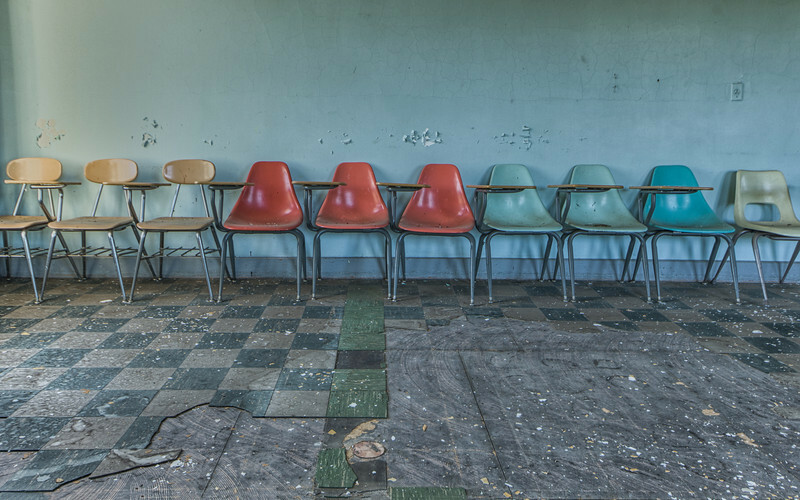 The asylum appears on both the state and national lists of Historic Places, but it is currently in a state of disrepair and is one of the most endangered historic places in the nation, according to the National Trust for Historic Preservation. The building was declared a National Historic Landmark in 1997. 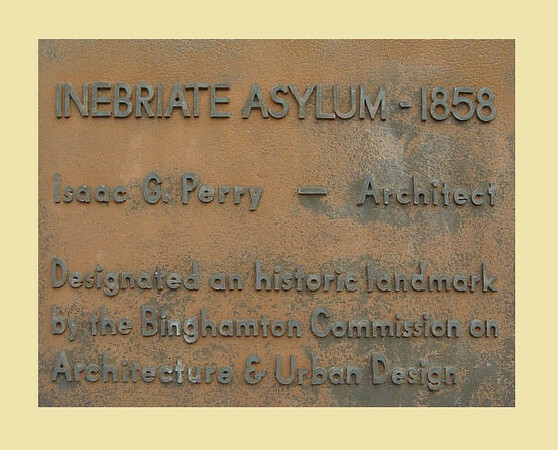 Construction of the asylum was located in Binghamton, NY and completed on May 19, 1858, and the corner stone of the edifice was laid on the September 24th, 1858. The style of architecture is called castellated Gothic, with massive towers, turrets and buttresses embattled at the top. The design of the buildings combined prominence with grace and elegance. All the exterior walls of the buildings are of grey stone. The interior and partition walls are constructed of brick. 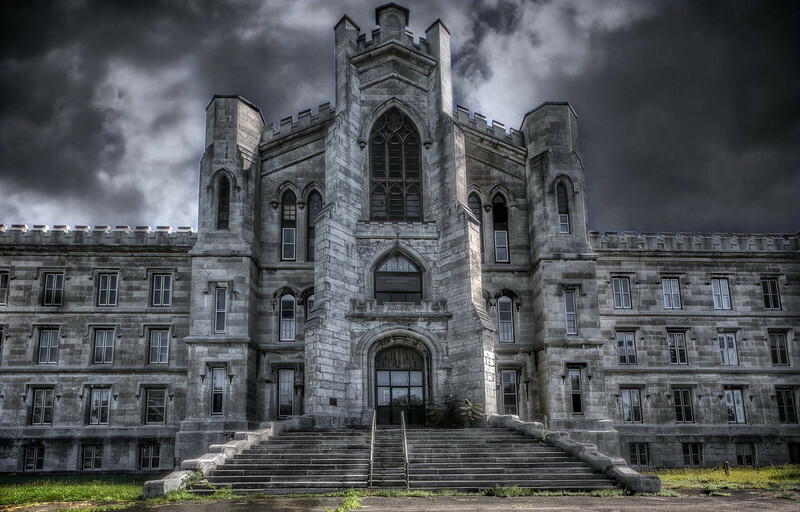 The length of the five buildings which comprise the entire asylum is fourteen hundred and fifty-three feet. The buildings were initially ventilated by nine hundred and fifty flues to displace the air in the hospital every three minutes. 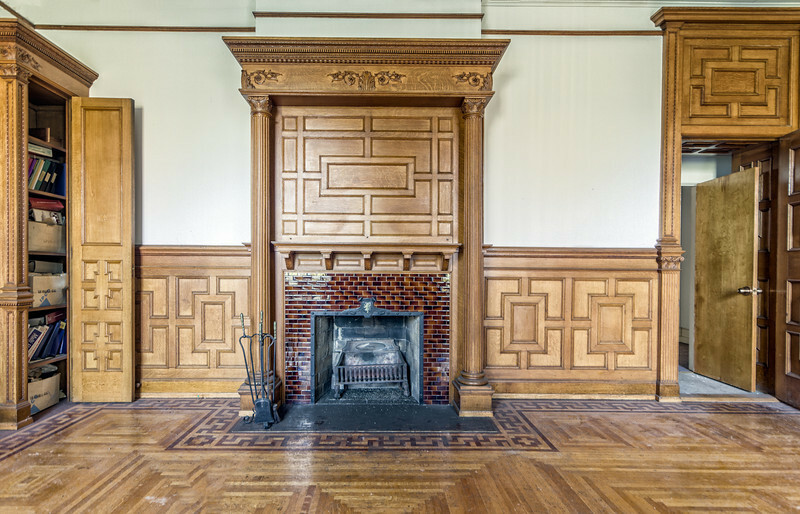 The rooms were also initially lighted with gas and the buildings were heated by steam with Gold’s Patent. 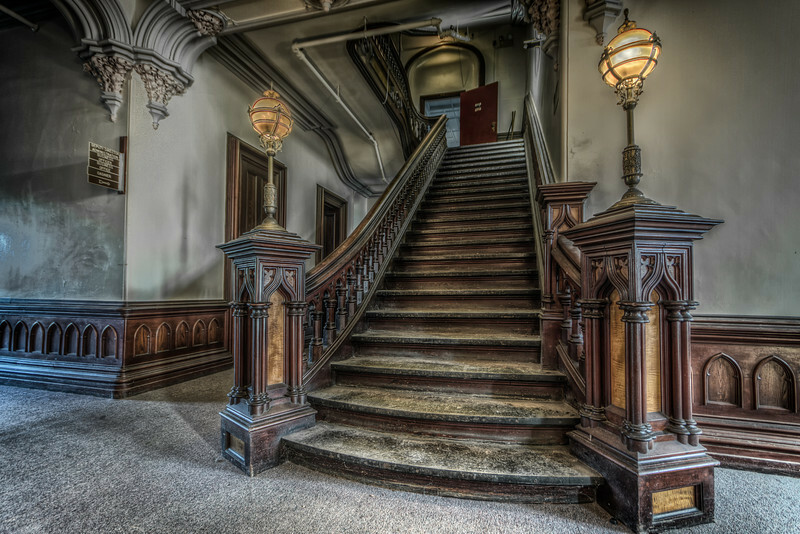 The air duct in which the steam pipes were placed for heating was located beneath the corridor floors of the basement, and was seven feet high, nine feet wide and fourteen hundred and fifty-three feet long. The flues in the buildings were constructed in the middle walls and are so arranged as to receive the heat and air from the air duct. 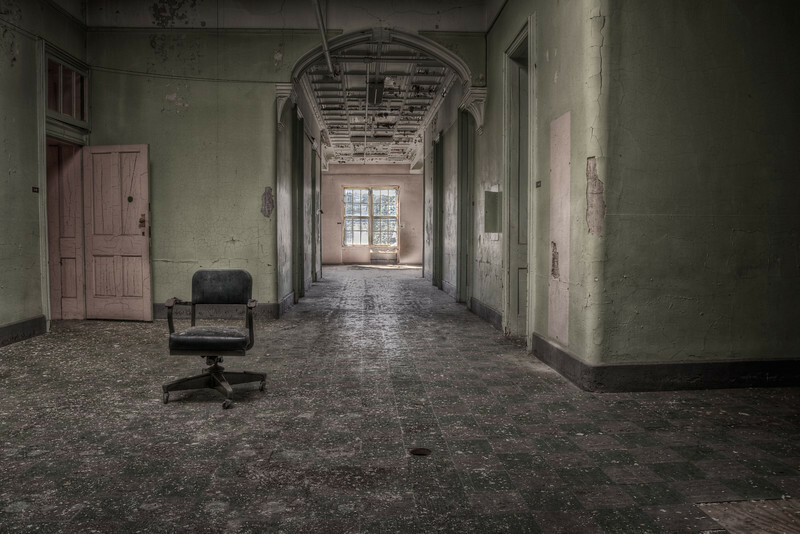 The institution was initially divided into ten wards of twenty-two rooms each for patients. 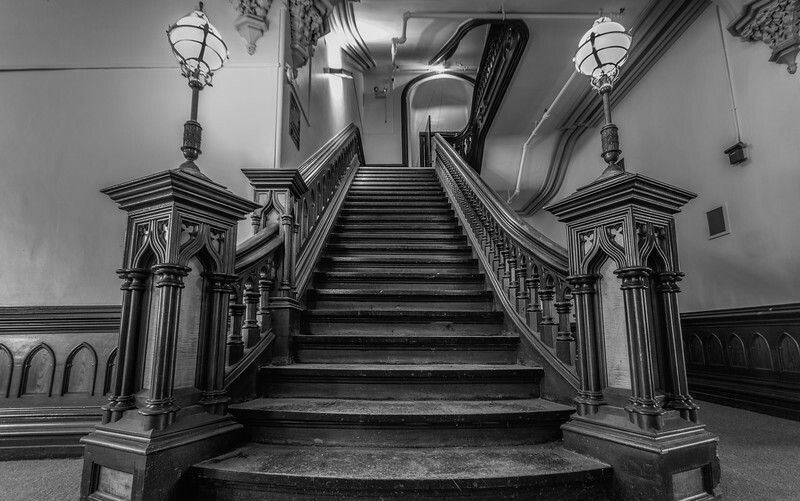 The rooms were eleven feet wide, seventeen feet long and twelve feet high. 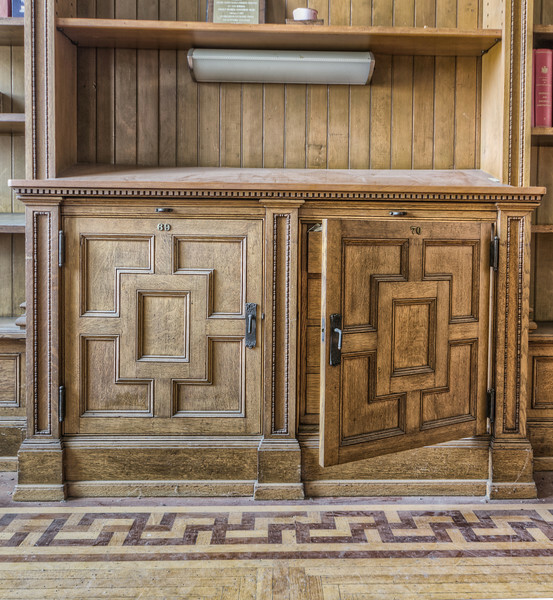 The library room was located in west building and was sixty feet long, twenty-eight feet wide and sixteen feet high, with a capacity for accommodating twenty-thousand volumes. The chapel is in the third story of the transept and was able to seat five hundred persons. Its dimensions are eighty-two feet long, thirty-seven feet six inches wide and forty feet high. It was lit naturally by ten large Gothic windows. The first story of the transept of the west building is divided into four rooms, each room is twenty-eight feet long twenty-four feet wide and fourteen feet high. 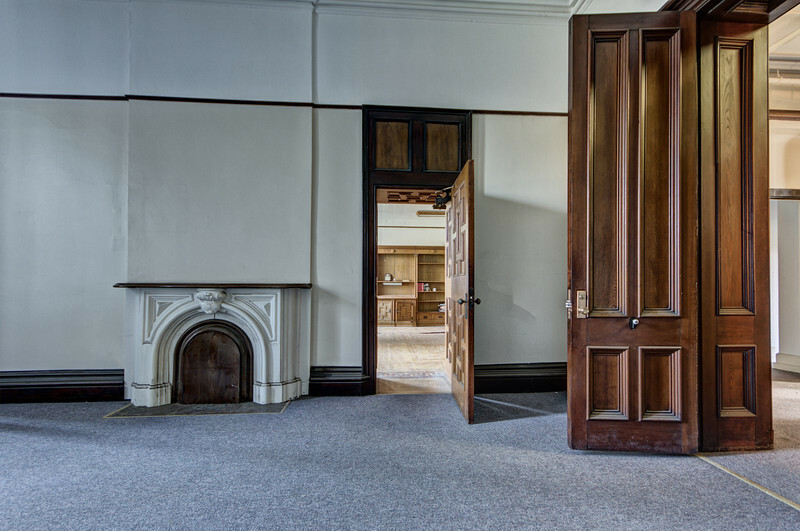 These were used for the Superintendent’s office, sleeping room, trustee room and reception room. The second story of the transept contained three parlors, two of which were each twenty-eight feet long, twenty-four feet wide and sixteen feet high. The third parlor was thirty four feet long, seventeen feet wide and sixteen feet high. These parlors were connected by sliding doors. The transept also contained sixteen tower rooms and was also divided transversely by a hall fourteen feet wide running from front to rear entrances and longitudinally by another hall of the same width communicating at each end with the corridors of the wings. The winter garden conservatory after completion was eleven hundred and fifty-four feet long, twenty-four to twenty-eight feet wide and accommodated about one million of plants, which provided the residents recreation, study and made for the asylum a glorius summer. Bowling alleys, billiard tables, river and water activities as well as an extensive gymnasium also contributed to the exercise and enjoyment of the residents. 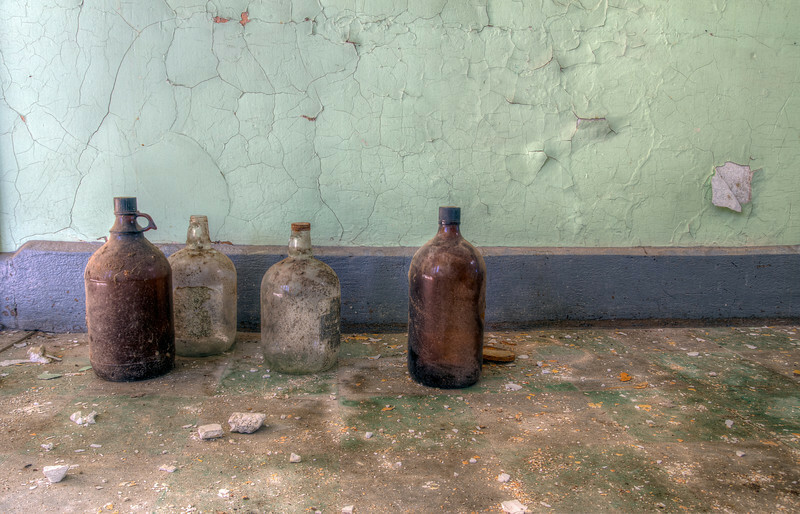 The kitchen was located in the basement of the East building and was forty feet long, fifteen feet wide and ten feet high. A small kitchen attached to the large one was twenty feet long, fifteen feet wide and ten feet high. The bakery that was located next to the kitchen was twenty-two feet square and ten feet high. There also was a large adjacent store room sixty feet long fifteen feet wide and ten feet high. 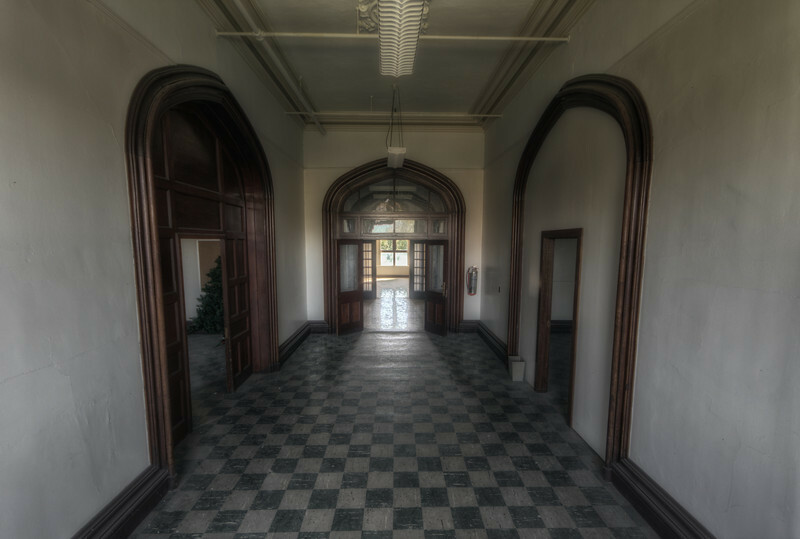 The asylum also had aseveral rooms including a grocery room which was twenty-five feet long fifteen feet wide and ten feet high. A vegetable store-room was one hundred and thirty-three feet long, fifteen feet wide and ten feet high. The buildings boiler room was twenty-eight feet long, twenty-two feet wide and ten feet high and the engine room was twenty-five feet long, twenty-two feet wide and ten feet high. There were four bath rooms each twenty-two feet square and ten feet high. The work shop was eighty feet long, twenty-two feet wide and twelve feet high. The wash-room was forty feet long twenty-two feet wide and twelve feet high. 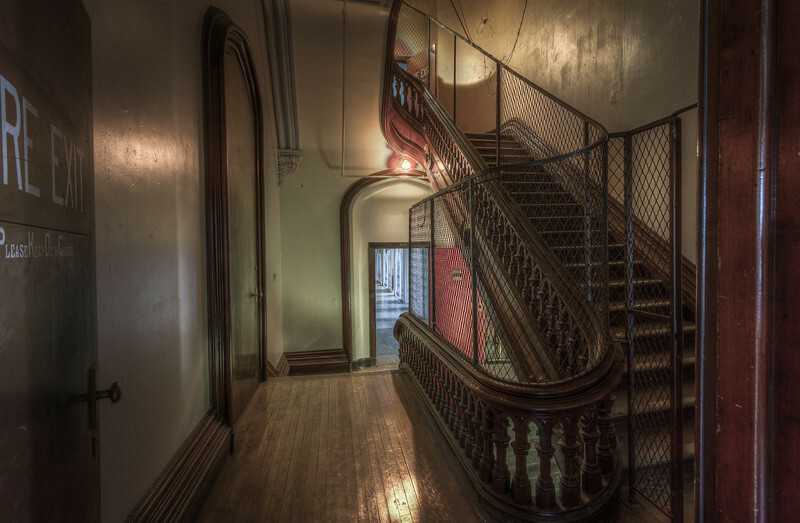 Fifteen rooms for servants were each eighteen feet long ten feet wide and twelve feet high.The woodwork of the West building was crafted from fine cherry, black walnut, chestnut, and maple oiled with paint having been originally used in finishing any rooms in the asylum. 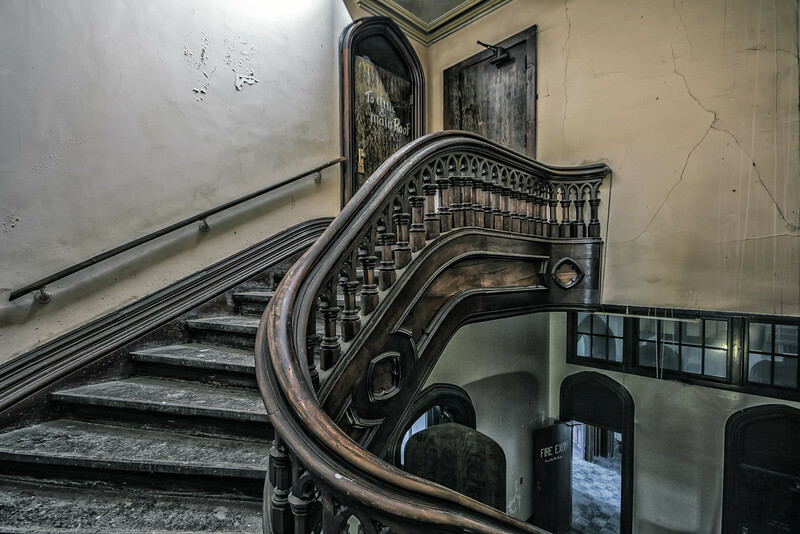 Through a series of events and connections obtained by myself and shooting partner Andy Wheeler of A.D. Wheeler Photography we were granted a one-time only all access pass to this amazing landmark. To those curious out there that are interested in this site, I urge you to just enjoy the photos and do not attempt to enter or go near this site. It is heavily patrolled and video monitored 24 hours a day. This was special access granted by the state for special purposes and we are very grateful to the powers-that-be to allow us this wonderful opportunity. Normally in my photo essays I like to include past history and background information on a site. In this case however, I have only included information on the actual building construction and dimensions. Circumstances beyond our control, which I am sure you can understand have deterred both Andy and me from sharing this amazing photographic adventure in words. So, I have decided that instead of the usual running documentary and history lesson, I will, for the first time, just post the photos from the shoot and allow your imagination to take you into another world that few are able to experience in person At the end of the gallery I will post informative links about the architect and historical information. Enjoy the shots and please consider purchasing some prints to help further my work!